Synopsis (via Goodreads): A twist of fate . . .
1) “The right words can bind someone more effectively than chains." 2) "Just because you don't understand or agree with something doesn't mean that it lacks merit." I think the synopsis is a tad misleading. I never thought of Devon as cold-hearted or rakish. He may have pretended to be in the beginning, but we can see that's not how he truly feels. The man is compassionate and puts the lives of others before his own. He didn't want the responsibility, but he handled it well and made improvements to benefit everyone, not just himself. Despite past exploits, Devon claims he hasn't been that way for awhile, and that those activities have lost their appeal to him. He was mostly bored with the life he had been living, and I think he (subconsciously) saw this as a new and exciting challenge. He vocalized feelings that came across as insensitive, but his actions almost always contradicted his unkind words. The other characters were very well-written, and I especially liked reading about the twins. I think the other sister, Helen, will be the focus of the next book, but I would really like to learn more about the twins and what their future entails. West (Devon's brother) was definitely a scoundrel in the beginning (but also not very cold-hearted) and was actually quite funny. He really fell in love with the people in the community and tried to better their lives however he could. He wasn't a guy in a suit afraid to get his hands dirty, but the one that rolls up his sleeves and offers assistance. Everyone in this book was a joy to read about, and really showed how working together in a community can be beneficial for everyone. Kathleen is a strong female character that doesn't clutch her pearls when a handsome man is around. She is able to stand toe-to-toe with Devon even when he's being impossible. I'm positive she influenced some of his decisions and forced him to view the world differently. There are some shocking revelations about her, and I'm glad she was able to find her own happiness. No matter what her circumstances were, her heart always bled for others. 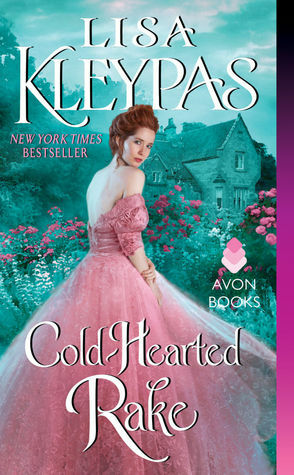 Cold-hearted Rake was an enjoyable read. The writing is absolutely beautiful, and a lot of the phrases have stuck with me. I had to buy this book to justify my ridiculous amount of sticky notes and tiny stars to mark my favorite places. I've heard amazing things about Lisa Kleypas, and this was my first book by her. I plan to read more of her books in the future, so if you have any recommendations, let me know! Side note: I don't know how people, especially children, survived mourning periods back then. It seems miserable and unhealthy. I doubt the deceased cared whether their loved ones had black over their windows, wore veils, or secluded themselves from the world. I would want my family to go on living and enjoying life, because death only shows us how short that life actually is. I can't imagine trying to keep my three children indoors for a year because their father died, and it would be "inappropriate" for them to play and enjoy themselves. Oh, and men had significantly shorter mourning periods. I love these stories even if the writing isn’t great so to have a well written romance is a huge plus. Lisa Kleypas is such a much loved author with so many romance readers and I've actually bought a few of her books which I haven't had the chance to read as yet. I love historical books that shatter gender roles, with strong female characters who are fiercely independent. So glad you enjoyed this one L and wonderful review! Thank you! I really liked this one and plan to read more of her books in the future. I've seen them around but never thought to grab one. I listened to an audiobook on a whim and loved it! If you have a chance to read one of her books, let me know what you think! I don't know which one to read next. I love Lisa Kleypas. I haven't read anything by her in a while though. I feel like she could easily become one of my favorite authors, but I need to read more of her books first! I liked this series! Her Wallflowers books are still my favorites of hers (and some of my favorite romances ever) but these were pretty good! I'll definitely look into those! Thanks! I haven't read one of Lisa Kleypas books yet, but I think I will read one soon. This book sounds so good. Thanks for sharing your review.